This page gives a step-by-step install guide to the BTnode platform. It is intended mainly for newbies - experts might want to consult the general Installation page for a brief overview. For further questions, please refer to the BTnode tutorials, the and the mailing list archives. We recommend using Windows as a development system, but any of the others work just as fine. If you are interested in the latest releases or want to build your own toolchain please check the Links section. The BTnode system software is based on the NutOS project. For a complete system, you will need to install both the NutOS sources and the BTnode-specific extensions (i.e., drivers, Bluetooth stack) called BTnut. 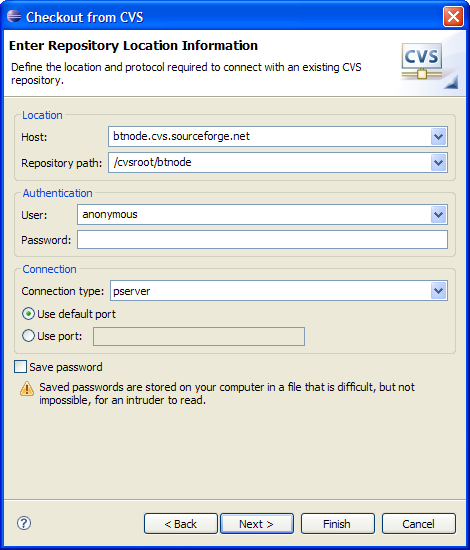 You can either install the BTnut System Software a) from the BTnutCDROM or b) from a CVS server. The latter one ensures to get the most recent BTnut version. Unpack BTnut_system_1.x.tar.gz from CDROM:\BTnut to your workspace (e.g., C:\workspace or ~/workspace). The files should be in the directory workspace/btnut now. Start Eclipse and go to the workbench. 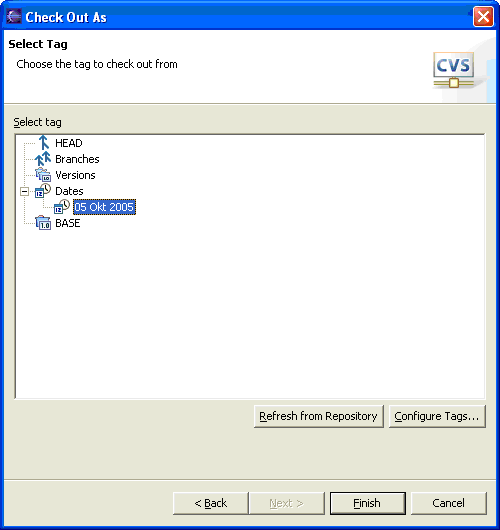 The sources can be checked out using eclipse. 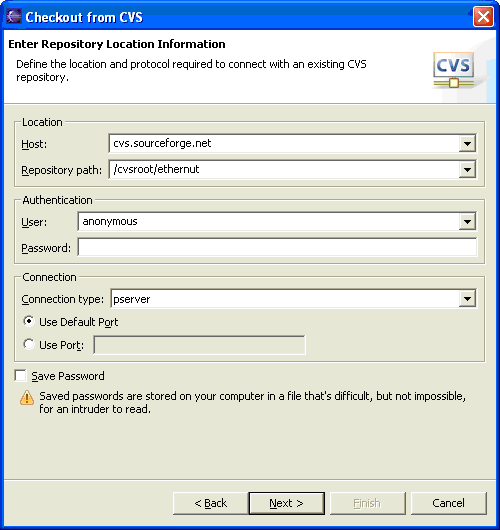 Select CVS | Checkout Projects from CVS. 'Next >'. Select Select a new repository location. 'Next >'. Use specific module name: btnut. 'Next >'. The NutOS version has to be fetched according to the BTnut version (the sources installed in the previous step). In order to do that, the date of the NUT_SNAPSHOT needs to be looked up in the btnut.Makefile. Check for the entry NUT_SNAPSHOT = yyyy-mm-dd and remember the date. 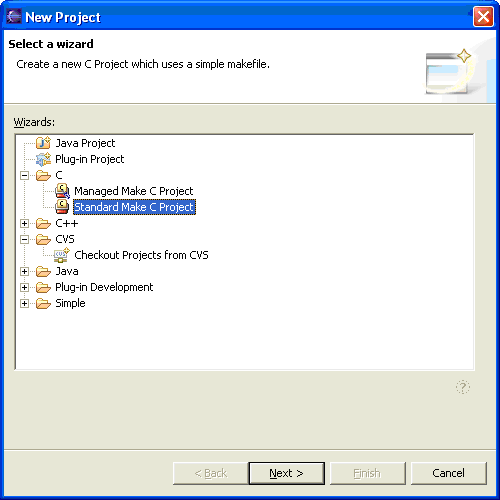 Select: Check out as a project configured using the New Project Wizard. 'Next >'. Enter the NUT_SNAPSHOT date as looked up previously. 'OK'. 'OK'. The sources are now being checked out to the directory workspace/nut. To verify the installation, we recommend to build and upload a sample application that comes with the system sources downloaded above: the bt-cmd.c application. In some cases you will need to install a bootloader application first that supports uploading new programs to the BTnode. 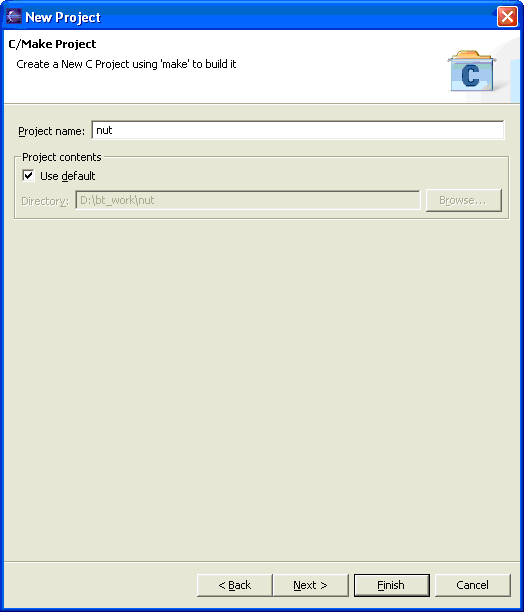 You can build the sample application using either the a) Console or b) Eclipse. Either way the sample application should be compiled without errors. Change to the directory workspace/btnut/app/bt-cmd. Change to the directory workspace/btnut/app/bootloader. In the Make Target subwindow: Right click on btnut/app/bt-cmd. Select Add Make Target from the popup menu. Target Name: btnode3 | Make Target: btnode3. 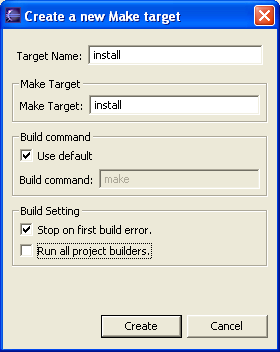 In the Make Target subwindow: Right click on btnut/app/bootloader. In order to communicate with the BTnode (once it is installed and is running out bootloader program), we use an extension board with a Silabs CP2101 USB controller chip. 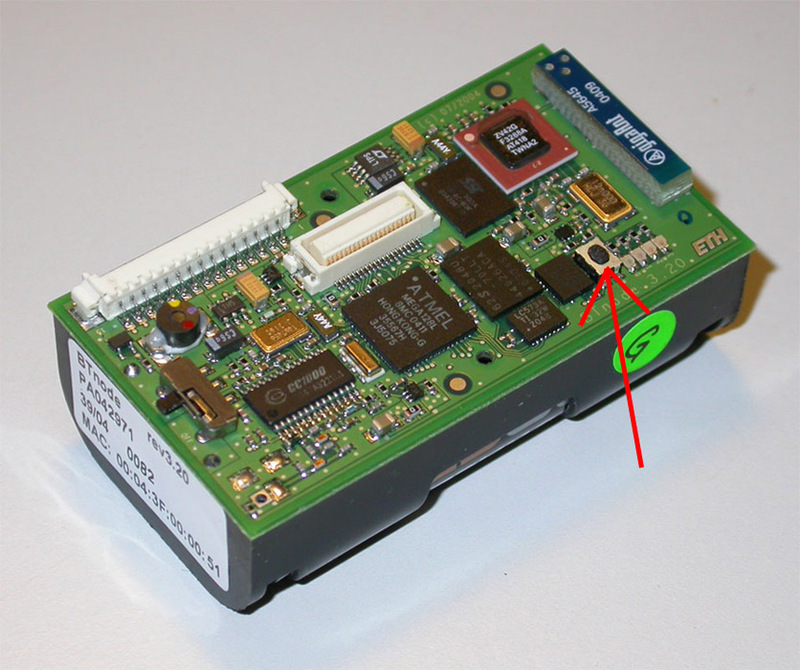 The CP2101 allows us to attach the BTnode to the USB port of our computer and have our Atmel microcontroller talk to the PC using UART (i.e., serial) communication. For this, we first need to install the appropriate drivers that create a virtual COM (serial) port. This port can then be used to both upload new programs and to input or output program data (e.g., printf statements). The LEDs will flash once after the BTnode is turned on (detach from the USB cable first!). They will continued to flash repeatedly if no application is installed. If your BTnode does not react this way, it probably has no bootloader installed, or the bootloader has been damaged (e.g., overwritten) and must be re-installed. This is described in the box below. The following instructions are for the AVR Studio on Windows. You can uisp and/or avrdude on Linux/Mac OS X. Unless your BTnode already comes with a bootloader pre-installed, you will need to initialize it once in order to be able to upload applications through its USB interface. This requires an AVR ISP Programmer, i.e., a piece of hardware that directly flashes the Atmel memory. Note: The instruction below allow you to upload any .hex file (program) to the BTnode rev3. However, as the AVR ISP Programmer is not very reliable and quiet slow, we strongly recommend to use it only to upload the bootloader! Once the bootloader is installed, it will allow us to upload .hex files using the USB serial bridge. 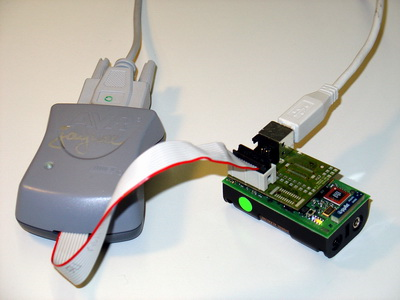 Connect the AVR ISP Programmer to your PC and to the BTnode rev3 USB Adapter board having the BTnode rev3 attached to it Screenshot. If everything is connected properly the green led on the AVR ISP Programmer should be green. The AVR ISP is not reliable if the transfer rate is high. Therefore switch to the Board-Tab and change the oscillator frequency to 32.7 kHz (do not forget to confirm pressing the 'Write Osc.' button). Switch back to the Program Tab. Device: ATmega128. Deselect Verify Device After Programming'. Flash: Input HEX File C:\workspace\btnut\app\bootloader\bootloader.btnode3.hex. Screenshot. After uploading the four flashing leds on the BTnode rev3 show a successful upload of the bootloader. Retry otherwise. As long the bootloader is on the BTnode rev3 is installed, the AVR ISP Programmer is not required anymore and can be unplugged. However, note that a corruption of the bootloader is possible if a very large application is uploaded - in such cases you will need to reinstall the bootloader using the procedure above! As soon as the bootloader is installed, it is recommended to access BTnode rev3 via USB and the USB prog board - due to performance reasons. When using Windows, you can also use the sburn.bat file: sburn bt-cmd.btnode3.hex COMPORT. [VP 1] Device is not responding correctly. Try again if it doesn't work. Windows Users: If it still does not work - this is due to a bug in WINAVR and will be corrected with the next release. As a workaround, unplug the USB cable from the USB prog board and plug it in again. Then repeat steps 1 through 4. Setup workspace/btnut/Makedefs to reflect your setup. Windows Users: If it still does not work - this is due to a bug in WINAVR and hopefully will be corrected in an upcoming release. As a workaround, simply unplug USB cable from the USB prog board and plug in again. Then try step 3 - 6 again. For help, type Ctrl-A followed by Z. You can also save default settings. See man minicom for details. Congratulations, you have successfully built and uploaded the sample application!